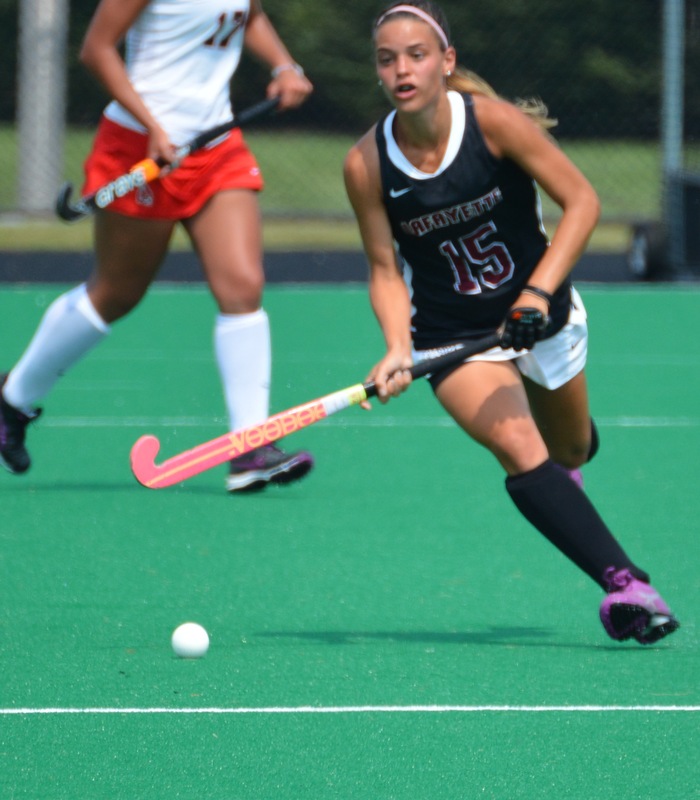 The Lafayette Leopards found a swarming, diverse offense in a 3-2 victory this afternoon at Rappolt Field. 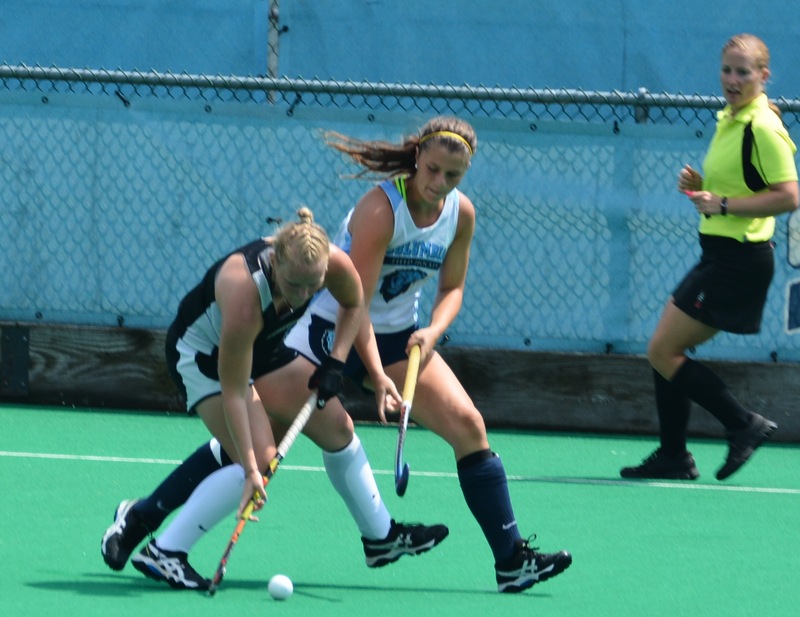 Paige Macrae used an assist from Ellen Colborne to score the first goal of her career. Using her strength in front of the goal Macrae gathered a nice feed right in the face of the Ball State goalie to open up a 1-0 lead 3 minutes and 15 seconds into the game. Ball State was not to be shut out as Lexi Kavanaugh used a Morgan Nash long pass to deflect the ball into the cage from the right side into the top right corner to knot the score at 1-1 at 20 minutes and 52 seconds into the game. It was at that point that the Leopards were to go ahead at 29:52 and were never to give up the lead when Amanda Madagan launched an unassisted high shot into the top right corner from the top of the circle. However, the Leopards were not done as only five minutes later with only 50 seconds left in the half, Hannah Millen was to deliver an insurance goal off a corner using an assist from Kirby Szalkowski and Rosie Shanks. The Leopards had to work hard for the final victory as Ball State with 46 seconds left in the game had Merinda Morley take a pass deflecting the ball into the goal. Time finally expired with Lafayette the victors. some offensive power as they took 17 shots compared to Ball State’s 13. The second point is the Leopards had too many turnovers, a point that will surely be corrected in practice before the Sienna game on tuesday. Third, there was a flurry of cards, more than I have seen in most Division one games.Fourth, the field was very hot and contributed to the fatigue that both teams felt, especially at the end of the game. There was a total of 26 minutes worth of cards given out to both sides. Lafayette in the first half, played short players for 12 minutes, which made their 3-1 lead that much more remarkable. In the second half, the Cardinals had 10 minutes in penalties, versus two minutes for the Leopards. A two minute penalty was awarded to Lafayette’s best player Amanda Madagan with less than one minute left in the game. In total. there were 7 cards given out, four yellows and three greens. The Leopard Field Hockey team boarded several vans this morning and drove up route 78 emulating the many commuters who use the route to travel to work from Easton to New York every day. They were not going to an air conditioned high office building today. Perhaps after they have their diploma in hand, it’s what they will doing, but today it was to battle with the Columbia Lions in 95 degree heat which certainly reached well over 105 degrees on the artificial turf. For this scrimmage the two head coaches decided on a format where the first period would be a full 35 minutes followed by two 20 minute periods and a practice shoot out. 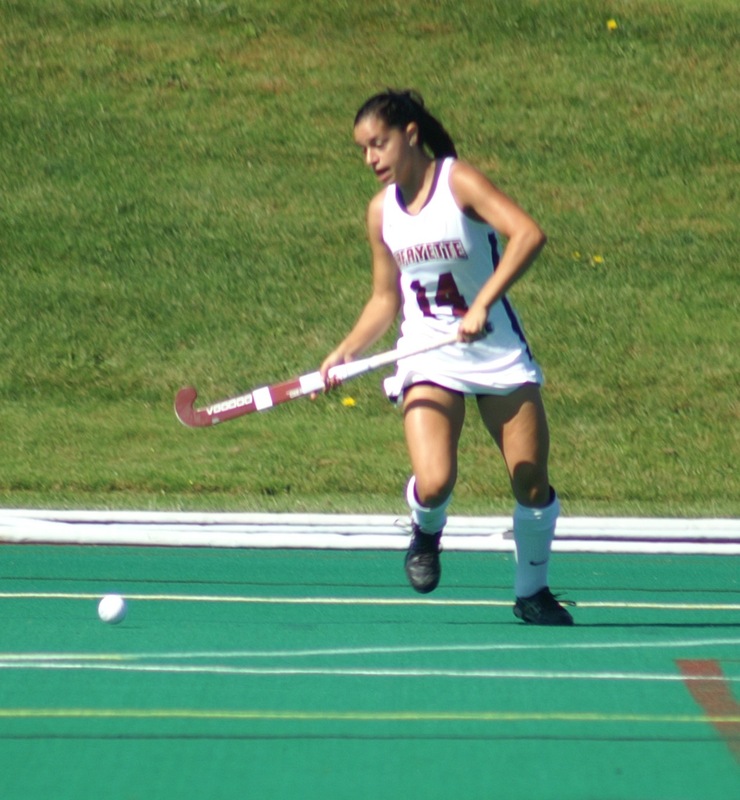 The three periods of normal hockey resulted in a 1-1 tie with the Lions drawing first blood on a corner and the Leopards returning the favor several minutes later on a corner of their own. I didn’t do an exact count, but I believe the Leopards had 4 or 5 corners in the first period to the Lions’ one. After that period, there were significant substitutions on both sides. Gabrielle Ulery, the Leopard’s freshman goalie played the second period and acquitted herself well, having several saves. The third period again saw significant substitution by both sides. 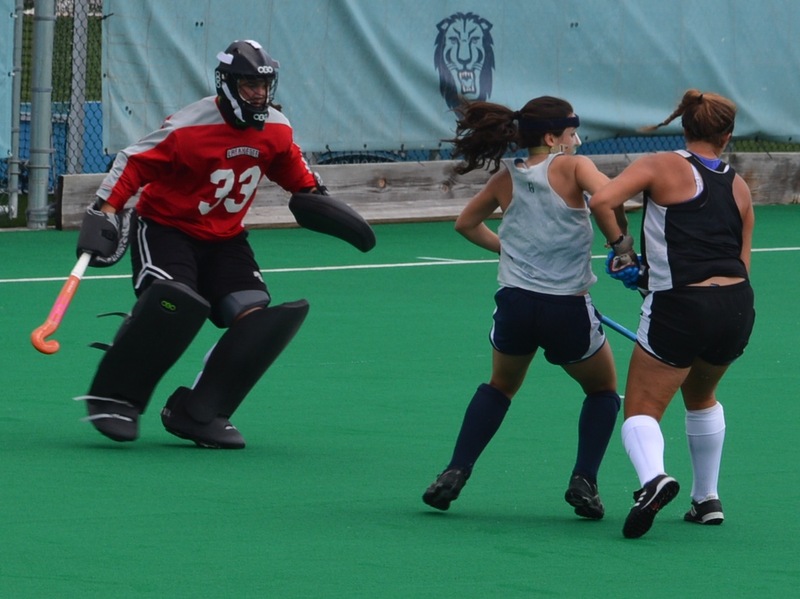 Katlyn Arnold continues to impress and Rosie Shanks and Ami Turner were involved close to the net often all afternoon. The Leopards showed significant speed and stick control as they spread the field well during the scrimmage. The heat, and the days of training showed, as both teams were expending good effort to try dominate play. From this writers perspective, the Leopards had the better of it, spending much of their time in Columbia’s space. The Lafayette defense was on their toes all game turning back a good Columbia offense. It was a good competitive finale to preseason, as thursday begins freshman move in. and classes begin the following monday. For the team. it will be time to evaluate these scrimmages. and to get into the rhythm of the regular season. 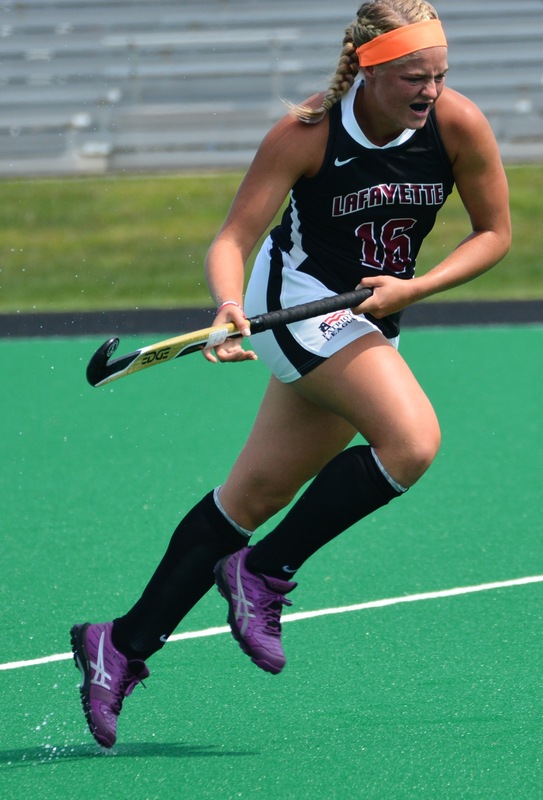 Sunday it’ll be Ball State’s turn to face the Leopards in Lafayette’s home and season opener. Ball State will play Rutgers the day before for their opening game of the season with a new coach. I think Lafayette has yet to play their best hockey. There is talent there, and I for one can’t wait to see how they do with fresh legs on Sunday at 12 noon. I have never been a big fan of polls and the latest Patriot League preseason polls demonstrates to me how worthless they can be. The best that can be said is that they are, in general an opinion of relative strength. 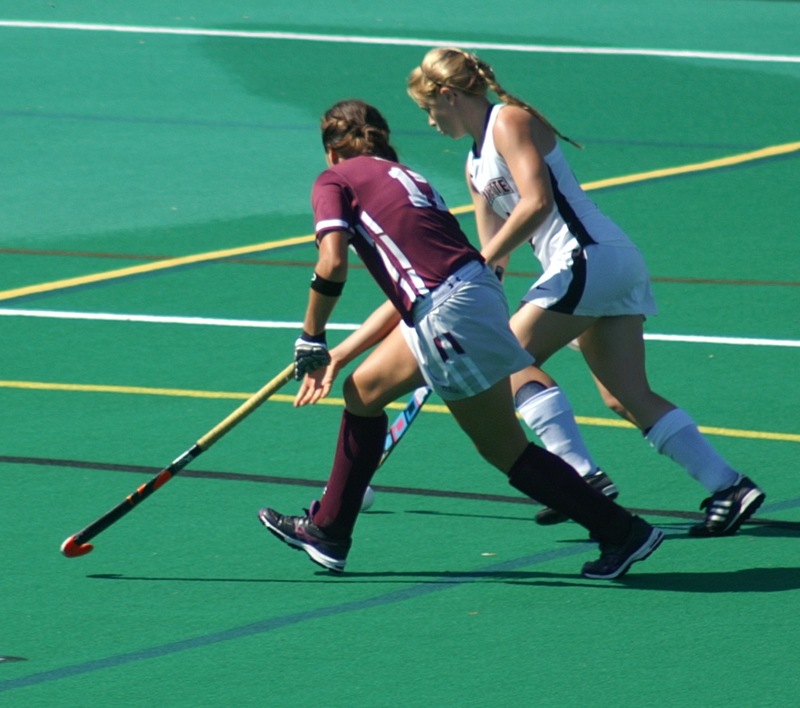 The latest example is the league field hockey poll with the predicted order of finish of Boston University, American University, Bucknell, Lafayette, Colgate, Lehigh,and Holy Cross. Coaches and SID’s (sports information directors) do the voting. Basically, they vote based on last year’s finish and maybe a little tweak here and there. When Lafayette won two championships in a row, the Leopards were not picked first in either case. I sometimes wonder if new classes and graduations are seriously considered by SID’s who couldn’t tell you if there are offsides in college field hockey. (There isn’t). What is obvious to me is how competitive the Patriot League has become. Anyone of the top five in the poll will be in the mix at the end. Only four teams will make the League tournament, that will decide who goes to the NCAA’s. 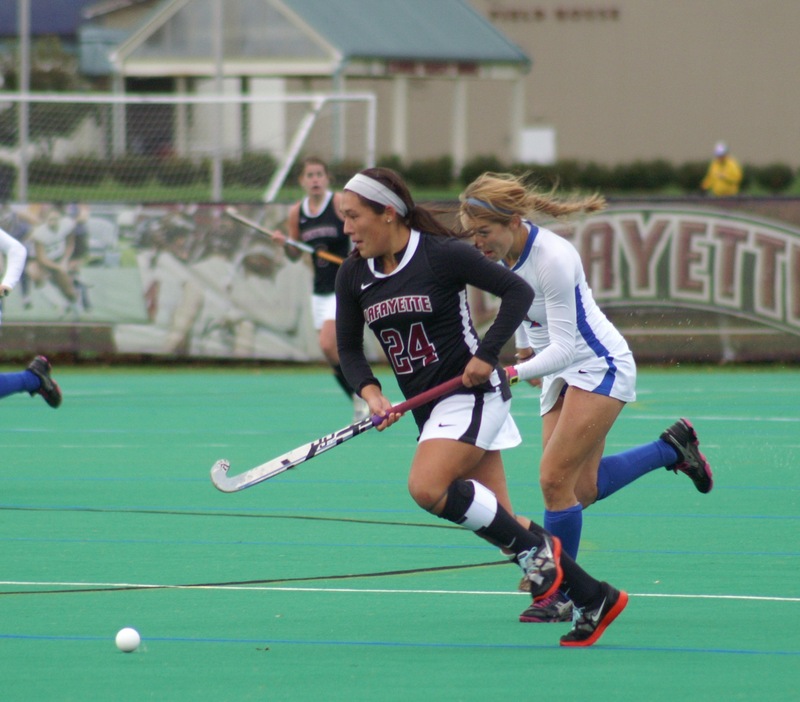 In the League games last year that Lafayette lost, the Leopards lost by only one goal in each of those games. Colgate got in despite a losing record and a very weak schedule. I don’t agree with the premise, that it’s only the league games that count. Yes, you must win the league games to go on, but in the year when the Leopards won their last championship their RPI and number 10 national ranking got them a better seed, and past the play in game with Princeton ( who won the eventual national championship). 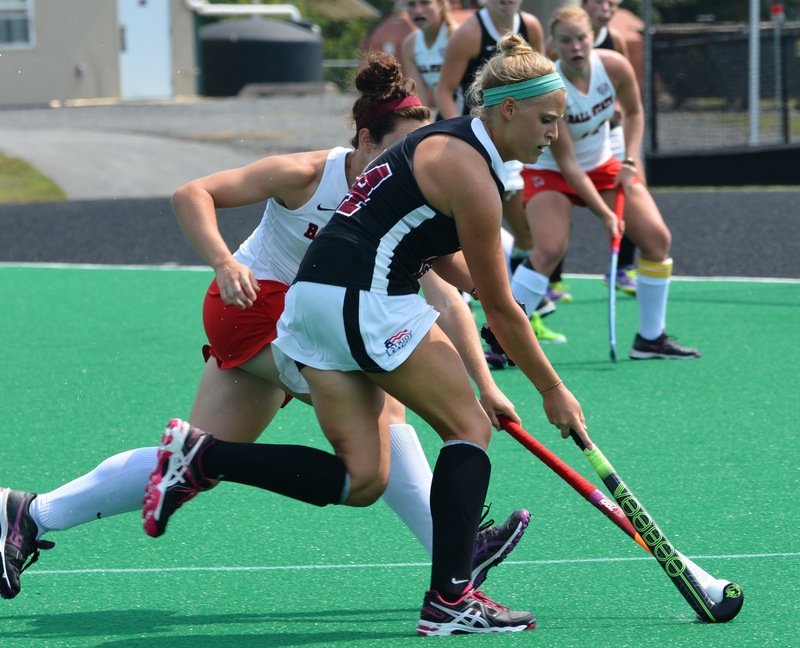 The leopards then played a competive game with Maryland losing 2-0. So what we are looking at are must win games in the league ( Colgate,Holy Cross and Lehigh) to get to the league tournament. Beating at least one of the other three guarantees a place and a good seed, and perhaps the home field. The leopards enter the season with a good freshman class which by all accounts will result in at least good minutes for its members.They will have large strength in their offense with multiple players capable of finding the back of the cage. The Lafayette goalie will be Kaitlyn Arnold, a high school all american now entering her junior year. The defensive line will be anchored by Hannah Millen entering her fourth year as a starter. It is a long season and the belly of the season with Uconn, Albany, Temple and a very dangerous Liberty University team (who lost to UNC 2-1 in the NCAA’s) provide very tough out of conference competition. It will all start tomorrow with a scrimmage with an improving Rutgers team at 7pm at home. Beating up on each other for the last week of two a days can get boring and tomorrow we get a peek at the future. As the Lafayette Field Hockey team entered their state of the art field for practice today I was struck by a coach’s three T’s, training, technology, and teaching. When I was playing football and lacrosse at Lafayette in the “old” days of the 60’s technology consisted of film (sometimes budget wiling} of practice, training camp was more like 3 weeks in some gulag where taking water was a sign of being a “wuss,” and teaching was a coach yelling at you for the next 2 1/2 hours. It all has become far more professional. We arrived at about 8:30 and within 15 minutes the players began to arrive to begin their second day of pre-season camp. With some gratification it was the freshmen who arrived first. ( no change there I remarked to myself) But as the eventual full 21 player squad arrived I did notice a distinct difference. Players were being wired up. Was this some new NCAA rule to insure that there is no cursing or abuse of players?? After thinking this was another conspiracy to soften our youth, I walked over to Emily Janis, the Lafayette assistant coach who was tending to a computer on the sidelines. Listed on the computer screen was a list of player names with output showing a list of numbers and a number with a percentage sign on it. Emily was more than eager to show me her new toy. During the session, skills were emphasized, including reverse stick shots, quick flicks, and popping the ball over the defender’s stick. Footwork and speed were closely watched at each station which drilled a specific skill. At 30 seconds left Coach Stone let her team know the drill was ending. Each player was to keep their own tally of goals during the drill which will be repeated in the afternoon practice. There are of course different levels of skill. Anyone would be impressed with Madagan’s skill set, but others like Millen, and Turner showed great ball control and Colbourne’s reverse stick shots looked deadly. Earlier in the day I asked Coach Janis on the overall level of fitness. She said about 90 pct came fit and ready to play, those that had not reached their goals are having some remedial training. Well, some things do remain the same after all, but the coaches assured EVERY player would be ready to play when the time came. The 2015 version of Lafayette Field Hockey finally officially arrived today, August the thirteenth. For the first year teammates, it’s the end of a journey that began as long a two years ago. There were searches, showcase camps, recruiting visits, a coveted offer, and finally signed commitment letters. This was not the first meeting for the new leopards. Each new leopard was a assigned a team mentor and has already had the opportunity to bond with their new teammates with whom they will be spending much of their college hours. My observation at the opening tailgate hosted by the veteran parents is that this group is already a team. It was a time for good-byes and welcomes, greetings and “see you soons,” and maybe a tear or two from anxious parents. But this will be a group that will be in contact often, as they follow their daughters in their next adventure, and friends will be gained as the Leopard’s most loyal fans will be in stands in Easton to Boston,Lynchburg Va. to Washington DC. From the other parents, they will learn about new rivalries and new hopes for new championships. Coach Stone and her staff will waste little time putting together this new team. The afternoon will be occupied by getting new uniforms, physicals, or receiving new practice equipment. 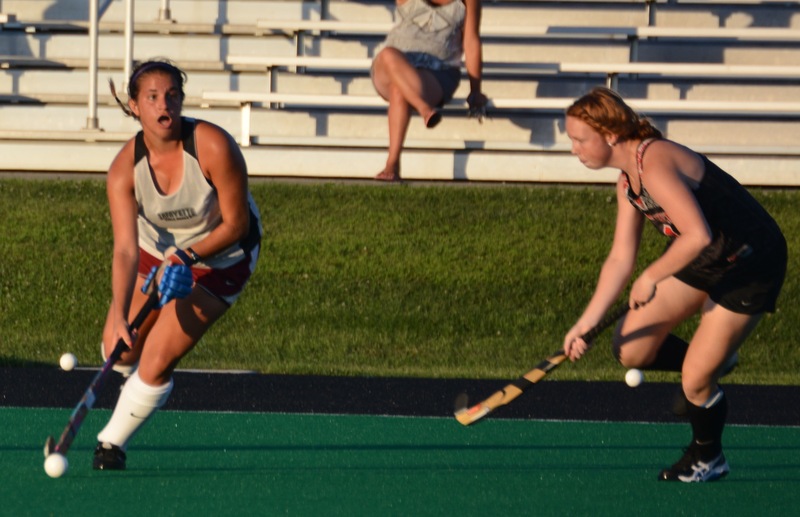 Their first taste of intercollegiate division one field hockey will come next week against Big Ten Rival Rutgers in a pre-season scrimmage. It is then, after a week of two a day practices, and strength training that all that effort will be put to the test. There are certainly questions to be answered. What will a newly constituted defense look like? Where will the scoring come from, and can the leopards raise their goal production in the coming season. Is the bench going to be deeper? This a program with a deep tradition of success and some of that recognition came in the form of the Patriot League naming of athletes to the all 25 year team. The Leopards claimed 5 to the team, Andrea Dagostino ’94, Deanna DiCroce ’13, Suzi Farrell ’92, Megan Monahan ’03, and Jennifer Stone ’04. To my mind there are two missing names, Emily Valeo who holds the Patriot record for assists, and Jackie DeAngelo who hold the single season records for save percentage of .91. Since there were multiple nominations for goalies, I suppose that hurt her chances but to this fan I think it was a glaring omission. In the coming weeks I hope to be able to report from practices spiced up with pictures and video. Until then good luck to everyone.